Reinhard Gerbert finalized his racing career after 45 years with a further European Champion title in the class Formula R1000 in September 2015 at the race in Jedovnice (CZE). 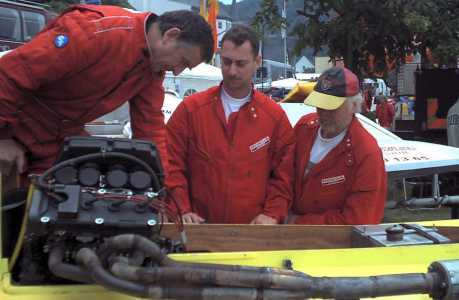 The Team Gerbert existed from 1989 to 2006 in this formation: Reinhard Gerbert as driver and Alfred Haxel and Holger Stoll as mechanics. Alfred (called Fredy) has worked as a mechanic for Reinhard Gerbert before too but left from racing in 2007. Reinhard Gerbert built a new boat in winter 2006/07. Holger Stoll was racing from 2007 to 2009 the former Gerbert boat. In 2010 Gerbert was racing a new boat again. Stoll was not longer racing himself and worked now together with Ralf Ogroske and Jan Röttig as mechanic for Gerbert again.